The incredible prophecies of Israel in the Last Days are the key to understanding just how close we are to the End of the Age. The Bible predicts virtually everything that has happened to Israel over the last 100 years. These prophecies are so detailed that we can now create a chronological chart that maps out exactly where Israel and the world are heading in this pivotable generation. These prophecies prove that God is working in the world to bring about the Return of Christ and the redemption of Israel exactly as promised. In the previous section, The Sign Posts of History, we looked at the overall chronology of the universe from the perspective of the Bible. Toward the end of that timeline, two events were listed with no further detail: The Rebirth of Israel and The Second Coming of Christ. In this section, we will examine more closely the time period surrounding these events and develop a chronology that focuses specifically on the Last Days and the prophetic events related to the nation of Israel. Since the land of Israel and the Jewish people are the main prophetic focus for much of the End Times, it should come as no surprise that recent Israeli history can be seen to reflect Biblical prophecies made thousands of years ago. These prophecies are now coming true in our generation with great precision. Examining these prophecies and determining how they might be placed into a logical sequence can lead to a complete understanding of what will happen to Israel in the Last Days. This process allows us to piece together the events prophesied in the Bible and fit them perfectly into a chronological map of where we are heading in the End Times. Many of these events include the fulfillment of prophesies that have already occurred from our perspective, and now become clear signals of the nearness of the Lord’s return. The initial events that led to the fulfillment of End Times Biblical prophecy concerning Israel began to occur in the later part of the 19th Century and the early part of the 20th Century. One of the most important developments, which would eventually lead to the reestablishment of the state of Israel, was the beginning of the Zionist movement in the late 1900s. Theodor Herzl is considered the founder of this movement, and he formed the Zionist Organization to primarily promote Jewish immigration back to Palestine (note that the term “Palestine” is only used here to denote the region that once was occupied by the nation of Israel, and not to imply that there ever was a nation known as Palestine). In Herzl’s 1896 book Der Judenstaat (The Jewish State), which became in effect the Zionist manifesto, he wrote of his vision of a near future, independent Jewish homeland that would be reestablished sometime in the 20th Century. The name of his movement, Zionism, was borrowed from the name of the hill near Jerusalem called Zion, which also became synonymous with the capital of Israel and the universal symbol for all those Jews yearning to return to their land. Zionism first became a popular movement among the Jews in Europe, particularly during the late 1800s and early 1900s. Antisemitic persecutions against Jewish people (called pogroms) during this period and combined with the rising tide of the Zionist movement fueled the passion that resulted in mass migrations of Jews out of Europe and back to the land which was formerly Israel’s. 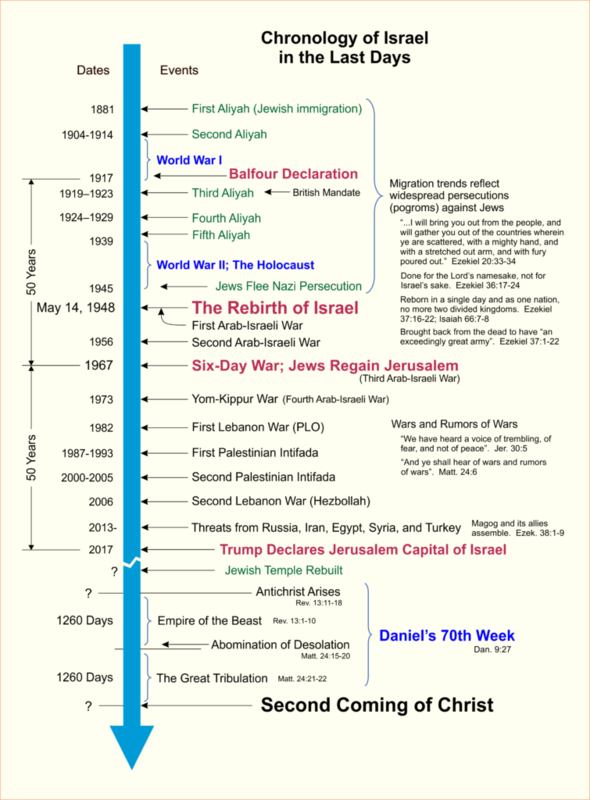 The chronological map of the Last Days in this section indicates two major immigration movements (called Aliyahs) that occurred before World War I, the first one happening before 1900 and the second one happening after 1900. These Aliyahs occurred during a period when the Middle East was still controlled by the Ottoman Empire, which despite these major early immigration events of Jews back to Palestine, the Islamic empire was not going to be accommodating to the Jews or to a Jewish state. However, the advent of World War I (1914-1918) changed everything. Germany (which was a focal point of antisemitism in Europe) was defeated, the Ottoman Empire (which dominated the area around Palestine) was destroyed, and the British Government (along with the League of Nations) ended up controlling much of the Middle East. 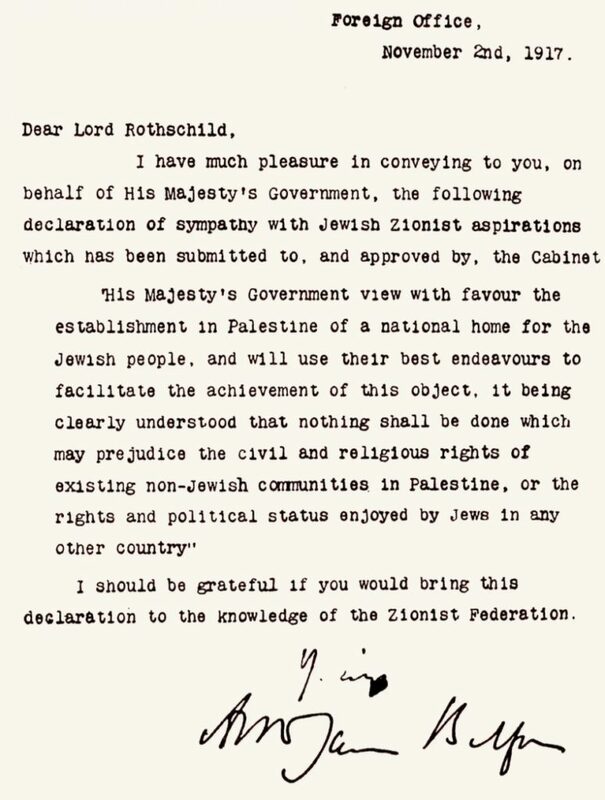 Even before the end of the war, the British government issued a monumental proclamation, written by Arthur Balfour and several others, that supported and permitted the return of the Jews to Palestine (see image of this letter). The Balfour Declaration, as it became known, was issued on November 2nd, 1917 and published on the 9th of that month. It represented a fundamental shift in the world’s position regarding the Jews and their former homeland. For the first time in nearly 2,000 years, the Balfour Declaration officially permitted the Jews to return to their homeland. Almost six years after the Balfour Declaration was issued, a second major proclamation was made by the British government and the League of Nations, which would forever change the landscape in the Middle East. This new document, entitled the British Mandate for Palestine, was issued on September 29th, 1923, and it became part of the much larger mandates within the Treaty of Versailles, which was enacted after World War I to manage the newly conquered lands and maintain peace. These mandates sought to develop the terms for administering the territories that were defeated in the war, not just in Europe, but in the region from the Mediterranean Sea in the west to Persia in the east. The mandates included maps for the creation of new states with defined boundaries from Palestine to Mesopotamia, which primarily made up the region previously ruled by the Ottomans. For the first time since 70 AD when Israel was destroyed by the Roman Empire and its people scattered among the nations, the British Mandate for Palestine created the possibility that the Jews could return to their own partitioned portion of land directly within their original homeland. With the British and the League of Nations in charge of dividing up the land throughout the Middle East, the Jews were suddenly left in a position where they could return to Palestine and escape the persecution they experienced in Europe and other regions. After the Balfour Declaration and the British Mandate for Palestine were enacted, three major Aliyahs occurred that resulted in hundreds-of-thousands of Jews immigrating in waves back to their homeland. These events combined for a total of five Aliyahs stretching from the beginning of the Zionist movement in Theodor Herzl’s time to the fifth Aliyah, which led right up to the start of World War II in 1939. The rise of Nazi Germany in the 1930s and the beginning of World War II again changed everything for the Jews. The antisemitic persecution that they endured in Europe before this time paled in comparison to the persecution they were about to experience at the hands of the Nazis. The Holocaust was one of the worst examples of mass murder and the attempted extermination of an entire ethnic population the world had ever seen. Millions of Jews were first persecuted and attacked, then rounded up and enslaved, and finally systematically executed in horrible concentration camps scattered throughout Germany-controlled Europe. Experts have estimated that over 6,000,000 Jews were killed during the scourge of the Nazi years. The persecution of the Jews and their desire to escape to their former homeland caused a major fulfillment of prophecy regarding their return to Israel. As discussed in great detail under several sub-sections under the main heading Israel, the Lord’s plan did not involve blessings for Israel in this process, but an angry ripping of the Christ-rejecting Jews out from the countries where they had been living to send them back to their land for judgment. These facts often run contrary to what many Christians believe has happened to Israel in recent times. No, God was not blessing them, but violently gathering them for judgment in the Last Days. As a result of these events, which uprooted the Jews from among the nations, the number of Jews in Palestine increased by over 24-fold from 1885 to 1946 as they fled persecution (see Zionism and Yishuv for a comparison of the Jewish population in Palestine throughout this period). The Lord violently ripped them out of the places to which they were scattered and returned them to their land just as the prophets predicted! Thus, the events on the chart leading up to the Rebirth of Israel included many periods of intense persecution against the Jews. Often these times involved violent Pogroms, which were mob attacks against Jews and Jewish property, resulting in assaults, thefts, and destruction. These occurred in Russia, in Germany, and in many other European countries. Pogroms also happened in many of the nations throughout the Middle East. The persecutions against the Jews began to uproot them from the nations to which they had been scattered and caused many of them to escape to Palestine in hopes of avoiding death. This period of violence culminated in the horrendous persecutions at the hands of the Nazis during World War II. As incredible as it may sound, the intense persecutions of the Jews throughout the world and their migration back to the land of Israel occurred exactly as predicted by the prophets. The top half of the Chronology of Israel in the Last Days is characterized by this quote from Ezekiel, which predicted that God would rip them out of the nations with “fury poured out” and bring them back to their land. The fear of the pogroms and the hope of the Zionist movement combined to shock the Jews away from any sense of security among the nations and move them back in mass to their land. All of these persecutions, therefore, would ultimately lead to the historic founding of Israel and the most exciting fulfillment of prophecy since the First Coming of Christ. 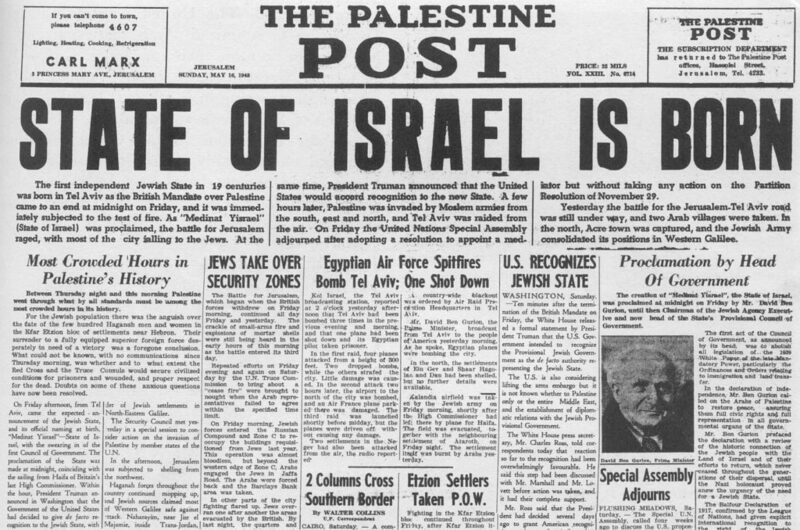 The most important prophetic event of recent history was the Rebirth of Israel on May 14, 1948. As the sections on Israel more fully discuss, this incredible event was the main sign signaling the End of the Age. For the first time in thousands of years, the Jews again had an official nation in the Middle East that they could call their homeland. Their rebirth occurred not as a result of protracted military campaigns, but it occurred in a single day with the Jews issuing a global proclamation, just as the prophets predicted (Isaiah 66:7-8). This event is the most important sign of the Last Days that we have ever witnessed, as most of the remaining prophecies concerning the End Times involve the nation of Israel and the Jewish people living back in their land. Some have scoffed at this, saying that the predictions of the soon Return of Christ have been made in every generation and that none of them have ever come true, thus this generation and time can’t be any different. However, it is primarily because of the Rebirth of Israel that we can know for certain that the End of Days is at hand. This event therefore is the primary harbinger of the End Times and the most important sign that the Return of Christ is drawing near! Moreover, the prophets predicted unique characteristics of this future state of Israel that also came true in their rebirth in 1948. Ezekiel predicted over 2500 years ago that Israel would be reborn as one nation, and that they would no longer exist as two divided kingdoms (Ezekiel 37:16-22). The nation under their first 3 kings, Saul, David, and Solomon, was mainly unified as one kingdom. However, shortly after the death of Solomon, the northern 10 tribes split off as the northern Kingdom of Israel while the Southern Kingdom of Judah remained separate in and around Jerusalem. This divided kingdom existed for centuries until the Lord finally scattered them out of their land as a result of the Assyrian and Babylonian attacks (see the Scattering of Israel and the Scattering of Judah and Jerusalem). In 1948, the rebirth of Israel occurred precisely as Ezekiel predicted. On the day of their rebirth, they became one unified nation in the land, and they were no more two divided kingdoms. This fulfillment of prophecy occurred thousands of years later despite overwhelming odds against it. In addition, Ezekiel predicted that the rebirth of Israel would be like a valley of dead men rising to be reborn. Israel had spent thousands of years scattered among the nations without any hope of returning to their land. Ezekiel prophesied that not only would these seemingly dead and hopeless people obtain renewed hope, but that the Lord himself would cause them to be reborn as a nation exactly in the very land that they came from nearly 2500 years ago. In addition, Ezekiel 37:1-22 describes these future events, and the prophet says that they would have “an exceedingly great army” when they return. Study the recent history of Israel and one fact stands out: they have had one of the most powerful military machines in the Middle East, and they have defeated all the enemies which surround them, multiple times. Despite their small population and land mass, they are ranked highly even in comparison to the world’s most powerful militaries. Yes, the prophets predicted the rebirth of Israel in incredible detail, and all of these prophecies were accurately fulfilled in our time! The time period after Israel became a nation was also accurately predicted in the Bible. As the chronology chart shows, it is marked by repeated wars with their Arab neighbors and decades of constant tension. Both the prophet Jeremiah and Jesus himself predicted that before the end there would be a time of “wars and rumors of wars” and “fear” and “trembling” would characterize the nation of Israel, not peace. Although the Bible clearly predicts a time when Israel would be reborn and live in peace forever, the Last Days are distinct from that future promise, because Israel now is heading toward a day of judgment by the Lord, which will culminate in their true rebirth in salvation and faith. There are many End Times prophecies in the Bible that are important to comprehend, but for a full understanding of how they could fit into a coherent chronology of the Last Days it is sometimes not completely clear until the events actually occur. The Rebirth of Israel is one such prophecy. The Lord plainly predicted that they would be reborn in a single day and become a nation in a state of unbelief leading to Armageddon (see for instance Jeremiah 30:3-7). However, God did not provide details of how many wars they would have to fight before the end, nor did he tell us that they would finally capture Jerusalem only after winning a series of battles in a spectacular Six-Day War. Only by living through the time period when the events actually happened are we now able understand how Israel’s days of trouble would unfold. Decades of wars and turmoil have been building to a point where Israel’s enemies are becoming too strong to fully restrain them by military strength alone. Pakistan has developed nuclear weapons and Iran is nearing completion of a nuclear program and missile development that will seriously threaten Israel’s security. Egypt and Syria are becoming more radicalized and are again calling for the destruction of Israel. The Iranian leaders have stated their goal of destroying the Jewish state in a nuclear holocaust. At the same time, terrorist groups in Gaza, Lebanon, and Syria have gathered thousands of short range missiles capable of striking within Israel. Meanwhile, the struggle between the Jews and Palestinians over Jerusalem is building to a crescendo that is being debated on a global scale just as the prophets predicted (Zech. 12:2). An incredible event that dramatically increased these tensions was President Trump’s declaration on December 6, 2017, that the US government would move its Embassy to Jerusalem and also recognize the city as the capital of Israel. This was the first time since the time of the united Kingdom of Israel during Saul’s, David’s, and Solomon’s time that Jerusalem was recognized as the official and independent capital of all of Israel. For all other periods, Jerusalem was either the capital of the Southern Kingdom of Judah or it was conquered and controlled by foreign powers. As we look at the recent history of the Jews back in their land, it becomes apparent that three significant events occurred over this time period, which are separated by 50 years. As the chronological chart shows, the Balfour Declaration was issued in 1917. This was the global proclamation that allowed the Jews to return to their land, which ultimately led to the rebirth of Israel as a state. Then, exactly 50 years later in 1967, the Jews regained Jerusalem in the famous Six-Day War. This was critically necessary to fulfill the prophecies of the End Times. Finally, 50 years after that event, President Trump declared Jerusalem the capital of Israel. These events that are separated by 50-year intervals would not have become obvious had we not mapped out the Chronology of Israel in the Last Days. Could it be that what we are seeing is a series of Jubilee years, wherein the Jews are being restored to their original property and land in a trio of amazing events? According to the law, Jubilee years are to occur every 50 years, and they would consist of a year of restoration of that which was lost, especially land and property. Jubilee years are to be separated by 7 sets of 7 Shemitah years (or 49 years), and the Jubilee year would immediately follow the final Shemitah year and thus mark the 50th year from start of the 1st Shemitah cycle within the set. In our generation, God has not only brought the Jews back to their land just as the prophets predicted, but he may be again bringing them under the Law of Moses as far as the observance of the prescribed Holy Days, Feasts, and Celebrations. Although no one knows for certain when the Jubilee or Shemitah years should fall, because their timing was lost after the fall of Jerusalem in 70 AD and the Jews were scattered, it could be that the Lord is actually revealing the proper Jubilee timings to us through these amazing events of restoration. Several years before President Trump declared Jerusalem the capital of Israel, Russia began to forcefully move into the Middle East in ways they had not done before. The upheaval of several Middle Eastern countries with violent revolutions during the Obama administration has caused Russia’s influence to increase throughout the region. Russia has now developed alliances with Egypt, Syria, Turkey, Iran, and Libya. They have set up bases in Syria and worked in a number of countries to support political sides in conflicts that are designed to coincide with Russia’s goals. Russia has also allowed Iran to set up military bases in Syria, an event that directly threatens Israel. These new Russian alliances involve the very nations that Ezekiel predicted would be aligned with them in their attack on Israel in the Last Days (Ezekiel 38:1-9). Especially interesting is the new relationship Russia has developed with Iran, which formerly was adversarial, because Iran viewed Russia as one of the evil infidel nations. The new Russian collusion with these nations will eventually lead to the start of World War III as Ezekiel predicted. When Gog and his allies descend upon the Middle East and attack Israel at The Time of the End, the entire world will be affected by the devastating consequences. The final events listed in the Chronology of Israel in the Last Days are all future events with no currently known dates associated with them. However, due to Biblical prophecy, we know for certain that these events must occur before the Return of Christ. For instance, based upon the prophecies concerning the Antichrist, we know that Israel must rebuild the Temple in Jerusalem in order for the predictions of the Abomination of Desolation to come to pass. Therefore, the Temple must stand in Jerusalem before the middle of Daniel’s 70th Week. At this time, we don’t know if the Temple will be rebuilt before the start of this final 7-year period or just after it begins. On the chart it is shown as occurring just before the start of the final 7 years; however, it just as easily could be built during the first half of Daniel’s 70th Week. Ultimately, the Temple’s construction could actually occur as a result of a negotiated settlement that is part of a broader Middle East peace treaty, which may correlate to the covenant the Antichrist will sign with many nations to signal the start of Daniel’s 70th Week. The Temple Institute in Israel is currently designing and building all of the required items for worship, including the golden lampstands, the Menorah, the tables and vessels, and even the alters of sacrifice. With modern building techniques, the actual construction of the Temple could occur very rapidly once the order was given to build it. In fact, the Temple Institute has assembled a new Sanhedrin and even appointed a provisional High Priest. The Jewish priests are now relearning Temple worship ceremonies in preparation for the Temple to be rebuilt. The specific prophecies dealing with the last 7 years of this age are clearly explained in the Bible as to their chronological sequence, even though these prophecies are scattered throughout several books. For instance, it is well established that the final seven-year segment will occur immediately before the Return of Christ, and that the Lord himself will bring the entire period to a close. Indeed, it is within this one final segment of the Last Days—containing by far the greatest number of prophecies dealing with the End Times—that the overall timing of events is best understood and defined. From the new information on this second chronology chart, we can see that Daniel’s 70th Week is marked by two equal divisions. The initial half, or the first 3-1/2 years, is primarily characterized as the “Empire of the Beast”, while the latter half is defined as the “Great Tribulation”. The latter name comes from Christ’s description of the horrible conditions predicted for that time. From the sections on the New World Order, it is obvious that these two titles are perfect as descriptions of what will happen during the final 7 years before Jesus returns.